You're Here: Home / Blog / Digital Signage / Can Dolby Vision make your content more life like? Can Dolby Vision make your content more life like? Have you ever noticed that the content that you filmed on high end cameras didn’t quite look the same when viewed on your TV ? Colours look at bit washed out? This could be down to density of pixels, refresh rate, contract ratio and according to Dolby, brightness. The fact is that cinema content and TV content never look the same. For Content Producers this make the transition from cinema quality to Television a problem. Cinema projectors equate to roughly 48 nits (unit of brightness) with TV at 100 nits. This makes TV twice as bright and with a limited colour palette still based on old CRT technology. This means that cinema has a broad range of colours yet low brightness. Take this to the TV and this is reversed. TV`s have a smaller colour range but much more brightness. What’s more, CRTs form the standard basis of virtually every modern display—televisions, cable broadcast, even Blu-rays. Even though we abandoned CRT a long time ago for flatscreens, we are still stuck with the old CRT standards. This excess brightness does not help contrast. In order to achieve great contrast you need black and the blacker the better. All this brighness affects the levels of black that can be acheived and this has a massive impact on colour and colour saturation. So the better the black levels the better the contrast, the more life like and real the subject matter will look. It’s an end-to-end method of preserving the image and color quality of content from creator camera to your eyeballs. 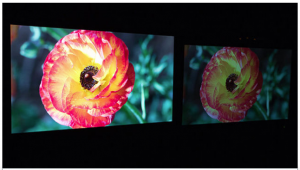 Working with TV manufacturers like Sharp and TCL, Dolby are creating “Dolby Vision” sets together with major content production studios and Nit industry standards. This will lead to more lifelike colours that don’t wash out under the added brightness. The image below shows the difference in image quality between a standard 100nit Tv set and a “Dolby Vision” enable system. Colours are brighter, vibrant and more representative of the original shot film. A new set of standards—dubbed BT rec 2020—has recently been adopted by the International Telecommunications Union (the people who establish these international display standards) that is based on the most recent advances in Ultra High Definition technologies, specifically the use of lasers to generate pixel colours rather than white light shown through rare earth phosphors. These new standards are helping pave the way for even higher performing TV`s. Give the great work that Dolby are doing to enhance our viewing experience, we can hopefully look forward to a more realistic viewing experience, that will be true to life. This entry was posted in Digital Signage, Hardware, News and tagged digital signage, digital signage content, digital signage for education, digital signage in cinemas, Digital signage retail by Dynamax. Bookmark the permalink.